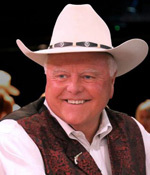 MISSION, TX - Texas Agriculture Commissioner Sid Miller visited Lone Star Citrus Growers to discuss key industry issues and tour the company’s facilities. He was accompanied by a delegation from The Texas Department of Agriculture. Previously, in July of 2018, Commissioner Miller’s office, along with the Texas Department of Agriculture, sponsored a delegation to South Korea which included VP of Sales, Trent Bishop. “The purpose of the trip was to explore the South Korean market’s viability for importing Texas red grapefruit, and we were pleasantly surprised by both the hospitality of the South Koreans and their interest in our product,” said Bishop in a company press release. The delegation met with the U.S. Embassy’s Agricultural Trade Office, Office of Agricultural Affairs, APHIS, and the three largest importers of U.S. grapefruit. The company noted that import/export negotiations are currently underway, and APHIS plans to address the project at the upcoming IPPC in Rome. During the visit to Lone Star Citrus, Commissioner Miller again reiterated his support of the project. While there, Commissioner Miller enjoyed a tour of the packing and juice plants given by Bishop, VP of Operations T.J. Flowers, and Warehouse General Manager Gustavo Serrano. “The Texas citrus industry is a vital part of the Texas economy, and I appreciate the opportunity to tour Lone Star Citrus and their state-of-the art-facility,” said Commissioner Miller. Lone Star Citrus noted in its press release that it was grateful to Commissioner Miller for his leadership in the installation of TDA signage along Texas state borders, warning travelers that it is “unlawful to enter Texas with citrus plants.” The signage is a key strategy in the fight against citrus greening and other diseases. During his visit, Commissioner Miller shared that he is working toward the installation of four new produce inspection stations that will further protect the Texas grapefruit crop. 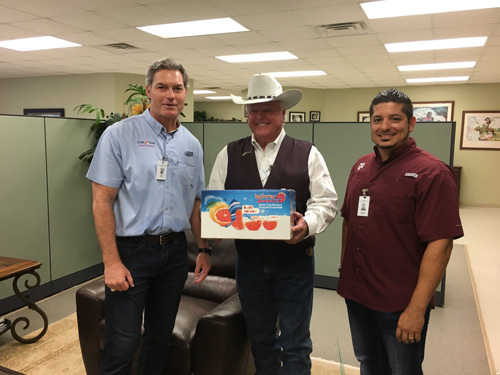 The Lone Star Citrus team stated that it appreciates the support of Commissioner Miller and the TDA, and looks forward to introducing Texas red grapefruit to new markets in the coming season. For the latest in produce news, stick with us at AndNowUKnow.